August 3, 2012  While job growth was the best it's been in five months, there weren't enough new positions added to payrolls to bring down unemployment. The jobless rate has been just above 8 percent each month this year. 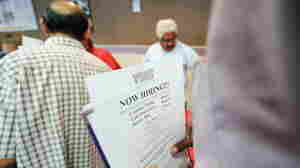 July 6, 2012  Economists had been expecting slightly better job growth. The jobless rate has been above 8 percent since February 2009. The report adds to evidence that the economy is slowing again. June 1, 2012  While the Republican contender blames what he says are the administration's "failed" economic policies for weak job growth, the president says he headed off another Great Depression. It's the central debate of the 2012 campaign. June 1, 2012  Investors are reacting to the much-weaker-than-expected report on job growth in May. June 1, 2012  Both numbers are disappointments. Economists had expected BLS would say the jobless rate was 8.1 percent and that payrolls expanded by at least 150,000 jobs. June 1, 2012  Economists expect to hear that a modest 150,000 jobs were added to payrolls last month and that the jobless rate stayed at 8.1 percent. They say employers just aren't adding jobs fast enough to bring unemployment down quickly. 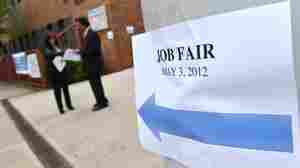 May 4, 2012  Job growth was weak, but the jobless rate edged down from 8.2 percent in March. April 6, 2012  Job growth in March was much below forecasts. 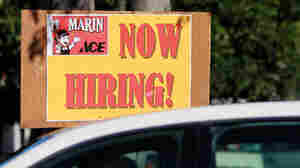 But the unemployment rate ticked down from 8.3 percent in February. March 9, 2012  Also, there were 227,000 net jobs added to private and public payrolls last month, the Bureau of Labor Statistics reports. 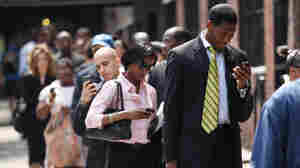 March 9, 2012  The much-anticipated February jobs and unemployment report is due at 8:30 a.m. ET. At 8.3 percent, the jobless rate would be about 1 percentage point lower than a year ago. February 6, 2012  In the first hour of Talk of the Nation, the history and goals of the Responsibility to Protect, and the opinion page looks at ***. In the second hour, the drop in America's unemployment rate, and a bike commuter's quest to catch a bike thief. February 3, 2012  As encouraging as the jobs report was for January 2012, it still is only the start of this general-election year. That means the jobless rate now will likely have less to do with what happens in the congressional and presidential races than where it stands in October. January 6, 2012  The most-anticipated story of the morning seems to be the December jobs and unemployment report from the Bureau of Labor Statistics, which is due for release at 8:30 a.m. ET.